LIQUID REAGENTS For Accurate Instantaneous Results. The kit comprises of liquid reagents to ACCURATELY TEST FOR PHOSPHATE LEVELS in swimming pools. The kit is a MUST for every pool professional. 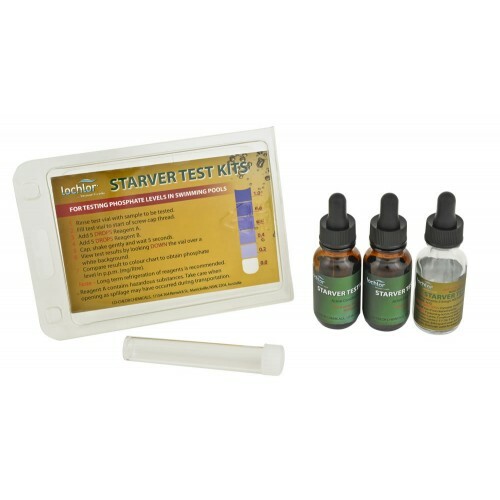 Ensure all living algae and algae spores are killed before you test for phosphates. If algae are present the test result will read ZERO as the algae have consumed the phosphates. Before testing kill algae by either Superchlorinating or using a Lo-Chlor Algaecide. Multiply results by a factor of four (4x) to give accurate reading.